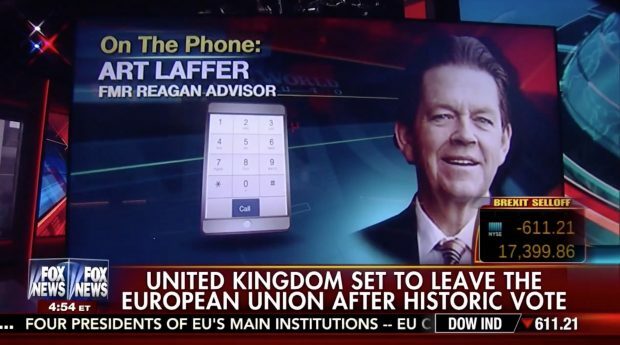 Art Laffer, a member of Ronald Reagan’s Economic Policy Advisory Board, says that Britain leaving the European Union is another signal that Donald Trump will become president. Appearing on Fox News’s “Your World” with guest host Maria Bartiromo on Friday, Laffer said that he thinks America is heading towards Reagan, Margaret Thatcher economics. “And the U.S. is about to say that to [Barack] Obama and Hillary [Clinton]. That enough’s enough. And what you’re going to see is the new order and it’s very much like Thatcher and Reagan,” Laffer said.